To chain the VST effects, select a slot and load a VST effect into it, the signal flow is as you expect : from the slot 000 to the last ocupied slot. You can save the chain preset in a file and reload it later, use the load and save chain button. 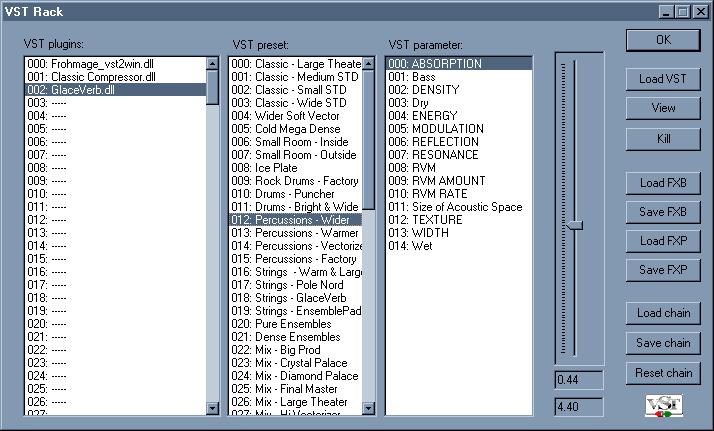 The chain file also store the actuals VST parameters state. "reset chain" removes all the VST from the slots. Note that the *.sor chain files format could change with newer version of Wavosaur.